Systems thinking offers a powerful perspective, a specialized language, and a set of tools that can be used to address problems and understand complex situations. Systems thinking is a way of understanding that emphasizes the relationships among a system’s parts, rather than the parts themselves. It helps us see both the forces that shape change and our role in creating them. Based on a field of study known as system dynamics, systems thinking has a practical value that rests on a solid theoretical foundation. Behavior over time graphs (BOTGs) are line graphs that are set up with time along the x-axis (horizontal) and the scale for one or more variables along the y-axis (vertical). When we investigate the behavior in a system, we often pay more attention to the overall shape of the change as opposed to the exact position of the data points. BOTGs are designed to represent our thinking. Some graphs display ‘hard’ variables, things that can be quantified. For example, scores on quizzes, number of homework assignments turned in, or recorded time running a mile. Other BOTGs represent ‘soft’ variables, such as confidence, satisfaction, enjoyment, and so on. All BOTG graphs allow our ‘mental models’ to take a visual form so we can share them, or analyze them ourselves. Almost all BOTGs, whether displaying hard or soft variables, are more insightful for their general shape and trend rather than the actual data points. Are things moving in the right direction? What? Describe the story the graph tells. So what? Analyze what is causing the behavior, and what structures are producing the results. Now what? Decide on a plan going forward and consider which aspects should be changed or encouraged. What is changing? Identify the variable being graphed. How is it changing? Describe the trend, slope, or trajectory. Why is it changing? Think about the causes and structures driving the behavior shown on the graph. What is the significance? Consider what to do based on the information and insight gained. Use these structures when talking with students, or ask them to write short answers in a reflection piece. In addition to the insight gained by drawing a graph of a specific behavior, adding a second variable often increases the learning by an order of magnitude. Encourage students to draw a second line on their graphs, and both you and they may gain perspective on their achievement and learning. For example, imagine if a student’s performance graph shows fairly a fairly flat line over the first few weeks of school. Then the line rises, representing steady linear increase since around Columbus Day. Ask him to think of a second variable to graph on the same pad, letting him know the scale may have to be different for the second line. Time spent on sports – maybe he finished playing on a soccer team and had more time for homework. Concentration in class – perhaps he changed his seat in class and distractions decreased. While some of the insights might seem obvious or trivial, two or more lines on one graph often push us to think about whether the variables are causal, correlated, or coincidental. Concepts in most content areas become clearer to students when they draw BOTGs with multiple variables. If you’d like to watch an interesting video showing BOTGs of common events, click here. The world can be viewed through a variety of lenses. When we look from the perspective of art, we may first notice color, shape, and other attributes that please us or evoke memories and emotion. As a scientist, we can ponder molecular structure, organisms’ roles in ecosystems, or estimate quantitative measures of what we see. When we think as a writer or historian, we might try to read into the stories behind the scenes we observe. As teachers, we are familiar with helping our students use these and many other perspectives as they learn subject after subject and travel from one class to another. Systems thinking can be a unifying theme amid this complexity and shifting frames of reference. The same tools, like behavior over time graphs and feedback loops, can be used across disciplines. For example, the iterative process of revision and improvement based on feedback is common to virtually all academic subjects, including both the writing process and the design cycle. Guiding students to recognize these generic traits of thinking and working can help us all become better at interdisciplinary learning. Take a look at the “Habits of a System Thinker” – you will recognize most of the habits as core values or desired behaviors in your life. No big insight there. The clouds on the ends of the flows mark the model boundaries. While it’s important where water comes from to fill the tub and where it travels when it drains, we are not modeling that larger system in our diagram. This is a simple bathtub map. Most people agree this causes a big problem, climate change. Projections of energy use point out how stubborn the inflow is. We are essentially running the faucet with the drain open, but the inflow is outpacing the outflow. If we level off our CO2 emissions somewhere close to current levels (a giant challenge), the inflow will still exceed the outflow. And when inflow > outflow, the stock increases. That’s true for water in a tub, CO2 in the atmosphere, organisms in a population, happiness in our lives … anything we can represent as a stock and flow. To reduce the level of CO2currently in the atmosphere, the rate of removal must exceed the rate of additional CO2 being produced. Interest payments are based on a rate represented by a circle called a converter. The interest rate is multiplied by the existing debt, adding to the stock of debt. This feedback connection is shown by the red arrows called connectors. Students can easily learn how to input numbers and equations in order to model this situation, learning some important lessons before getting their own credit cards. Most people benefit from the discipline and practice necessary to draw stock and flow maps. Their simplicity and clarity of design provide another communication tool representing how a system operates. We help students gain an appreciation for rates of change, feedback, and other elements of systems when we integrate stock and flow thinking in our curriculum. If you use any of the activities in The Shape of Change, have a look at the section in the newer editions of the text or on the web to see stock and flow explanations of each activity. Most of us are familiar with feedback in several contexts. If you hold a microphone too close to a speaker, the amplified sound is picked up by the microphone and transmitted back to the speaker, where it is broadcast to the microphone again, and pretty soon … ouch! Cover your ears. Another example of feedback occurs when a person observing behavior provides information and opinion to another person. That feedback may cause a change in the behavior, which can be observed again and further analyzed. In systems thinking, which deals with changes over time and the causal elements that drive those changes, feedback has a special but similar meaning. 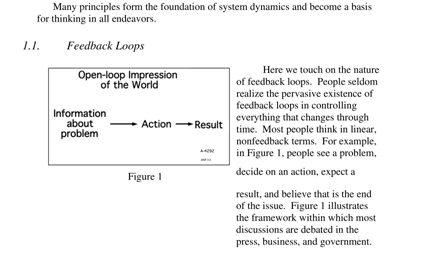 Feedback is identified as a loop mechanism. Think about a performance improvement loop, or virtuous circle. Practice some skill, such as playing music or athletics, and we get better. When we get better, we can perform at a higher lever, and we can get even better. Unfortunately, vicious cycles exist also, like inflation. Prices go up, so workers negotiate higher wages. Higher wages increase buying power, but companies raise prices as it becomes more expensivve to produce goods, partly because of increased wages. In systems language, these up or down spirals are called reinforcing loops. Let’s look at performance in a different way. What if I don’t care about getting better at my lessons? But my parents care and apply pressure to me. So I practice and I get better. Once I satisfy them however, I can back off on practicing. Then my skills begin to erode. That makes my parents react, so I have to increase practice again. I stay with this oscillating pattern, practicing enough to keep my parents off my case, but not working so hard that I forego other activities I’d rather do. This “wave-like” pattern is a balancing loop. A thermostat is a good example of a balancing loop in our everyday life. Heating or cooling is called for when a certain temperature criterion is passed. Once it is met, the machine doing the work shuts off, until the measure of heat in the room turns it on again . 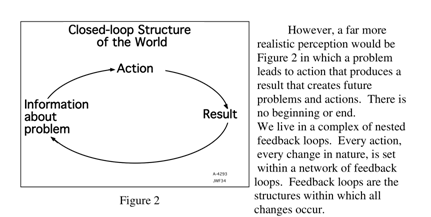 Connection circles and causal loop diagrams are the systems tools we teachers and students use to represent feedback thinking in our learning. At IACS, applications of feedback thinking have been developed and applied in most content areas. Many educators believe feedback tools can help boost reading comprehension and support some major goals of the Common Core Standards. In this version of the iceberg diagram, Events are noted as observations. Patterns of Behavior lend themselves to behavior over time graphs. 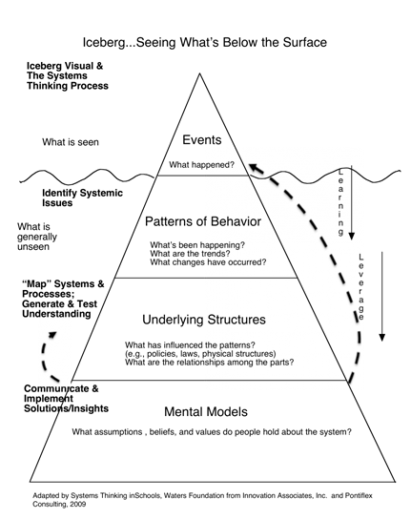 Underlying Structures can be represented with stock and flow diagrams, models, and feedback loops. Mental Models are deeply held beliefs and assumptions that lie at the deepest level of systems. 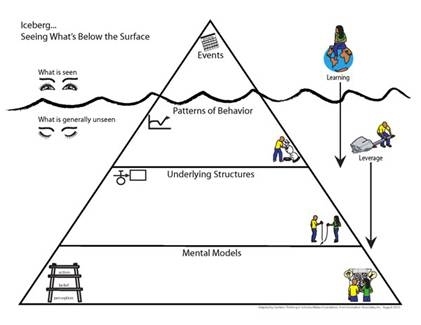 This next version of the iceberg diagram has questions as prompts to push our thinking as we consider the layers of behavior that drive a system. Information, articles, lesson plans, conference information.